The mushroom gods don't always reward us with the fruits of the forest floor; sometimes their gifts are just as beautiful, but of a different kind. Take last Wednesday, for example. We were on Mt. Hood, scouting in our favorite puffball spot around the 3,000 foot elevation. The afternoon was warm, and the earth was pretty much devoid of snow. Perfect, we thought, for gathering the first puffballs of the year. 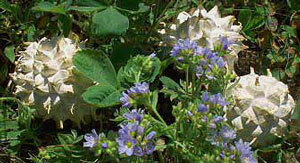 surrounded by clusters of lovely blue flowers. Every February when our annual recipe contest closes, we're always excited to see what our e-mail box may contain, and this year was no exception. We received so many splendid entries, and our judges really had to work hard to build a consensus as to which of the submissions was the most deserving of First Prize. Jenn's Braised Beef Short Rib and Lemon Pea Ravioli with Morel Mushroom Cognac Cream Sauce was one of several recipes that caused the judges to sit back in their chairs, release a big sigh, and wonder if maybe there would be a tie, for the judges loved Jenn's short ribs in this upgraded, comfort-food preparation. 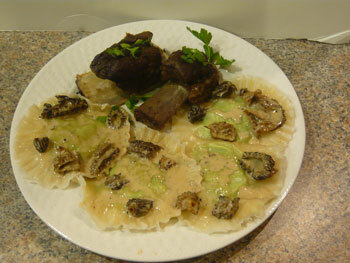 They were taken aback by the lovely ravioli with its jewel-like packets of pea and ricotta crowned with a luscious morel cognac cream sauce. "What a remarkable dish" was their unanimous declaration! response to our annual call for recipes that included mushrooms. A little background about the recipe, I went to an Italian restaurant and had this hand made ravioli in a braised short rib sauce. Being the foodie I am and cooking being my passion, I naturally went home and recreated the dish, just with some of the flavors I enjoy and that go well together. Lemon zest and peas, I think, pair well together. The zesty pea puree adds a bright pop to the decadent short rib that swims in a creamy cognac sauce which coats the steak-like morel mushrooms. I live with my little girls, Kaia, who was born the summer of 2006 and, Marlee, who was born in April of 2013, and our epileptic four-legged furry kid Raider. I began cooking around the age of twelve for my parents and self, and since then have only grown to love the art even more! Since the age of fourteen I have worked in the food and beverage industry, mainly in restaurants creating within myself quite a little foodie monster. In April of 2007, I became a member of Cooking Contest Central where I began my recipe contesting. I have had quite a few wins so far and don't plan on stopping! My mantra is you can't win if you don't enter! My style of cooking is what I call Califusion Comfort Cuisine, creating from super healthy hippie food, but still tasty of course, to comfort foods, utilizing a variety of cuisines from around the Earth... especially Italian and Mexican, as those are my favorites! I like to say, "Like music, food is the universal language of mankind through which we can all bond." 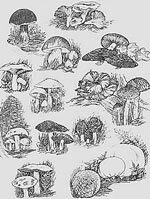 I haven't really had experience with wild mushrooming, but it sounds like fun! I have a food blog, My Kitchen Kreations To You, which is also on Facebook and other social media sites.